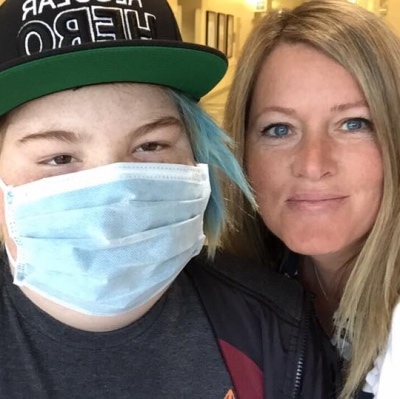 After beating back two life-threatening illnesses, the resilient teenager has a new heart to take forward and a bout with cancer to leave behind. Consider this a chicken-and-egg discussion no one ever wanted to have, but knowing which came first, the leukemia or the heart failure, is imperative to understanding the course of Casey Fisher’s medical history. “It’s good to get the story right,” says Children’s Hospital Los Angeles oncologist Paul Gaynon, MD, reviewing Casey’s file. Particularly one such as this, an unusual and extensive case that takes thoughtful unraveling, and might have played out differently had the chicken and egg and any components in between been sorted out sooner. The first signs of illness came in 2012, when for several months Casey experienced a barrage of symptoms: rashes, fever, night sweats, shortness of breath, lethargy. Frequent doctor visits didn’t help. His most alarming indicator—an elevated number of white blood cells called eosinophils—was played down. 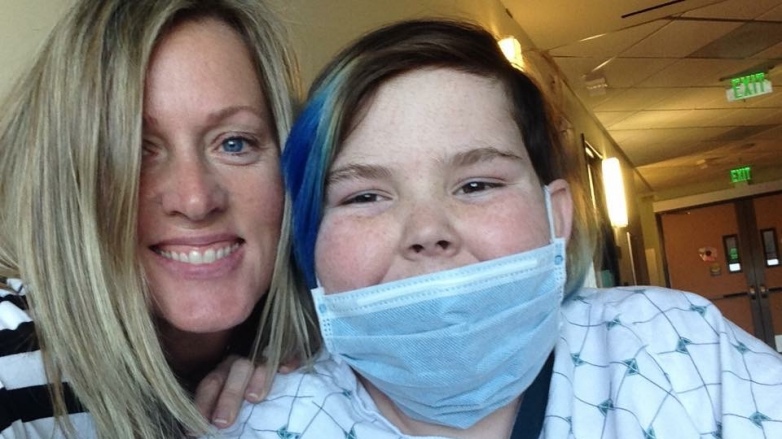 “The pediatrician kept saying, ‘No, he doesn’t have cancer; he has parasites,’” Casey’s mother, Susan Fisher, says. As Casey continued to decline, his father, Alan Fisher, demanded a referral to Children’s Hospital Los Angeles. Within a day, the family was at CHLA, where a bone marrow test found leukemia. Gaynon explains that a high level of eosinophils, or hypereosinophilia, can suggest parasites, but at the volume Casey had them—65 percent of his white blood cell count; the normal rate is under 5 percent—it can indicate a type of cancer, acute lymphoblastic leukemia. “What happens is, the leukemia cells make a cytokine, like a hormone—a chemical that drives the body to make eosinophils,” Gaynon says. Blood tests pick up the eosinophils, but not the leukemia, which can lead anyone who isn’t familiar with their association to attribute the eosinophils to something else, like parasites. “Unless you know,” Gaynon says, “it’s an unusual presentation.” He may see one every five years. The high eosinophil count raised another concern. Hypereosinophilia can cause inflammation throughout the body, according to Casey’s cardiologist, Jondavid Menteer, MD, irritating the lining of the heart and leading to the forming of blood clots. An echocardiogram performed the day after the leukemia was uncovered found blood clots in Casey’s left ventricle. Within 48 hours of arriving at CHLA, after months of non-answers, Casey Fisher had two conclusive diagnoses: leukemia and heart failure. “Our world was crashing around us,” Susan says. Within a month, chemotherapy erased the cancer, while it was hoped that blood thinners would dissolve the clots. Casey returned home the day after Christmas. A few weeks afterward, he ran out to flag down an ice cream truck, and in his haste tripped in the front yard. He got to his feet, made his purchase, and returned indoors. Casey collapsed on a couch and began screaming that he couldn’t feel his legs. He was raced to the local hospital in Upland, where a helicopter ride to CHLA would have followed, but the facility’s helipad wasn’t operating, so Children’s Hospital had to send an ambulance. “Nobody really wanted to touch him because no one knew what was going on,” Susan says. At CHLA, an X-ray provided an answer. The force of the fall in the front yard had dislodged the blood clots—hence, Alan’s inadvertent pun. They settled in Casey’s aorta, mid-abdomen, cutting off circulation from his waist down. 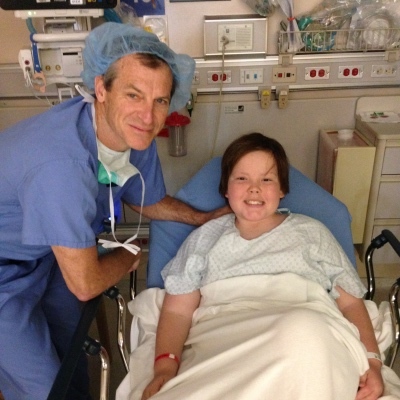 It took eight days before Casey stabilized, at which point CHLA surgeon James Stein, MD, proposed to go in and expel the clots. Stein delivered on his assurances, removing the clots, but Casey’s heart function had been weakened. He couldn’t walk from the front door of the family’s house to the sidewalk, or from the CHLA parking garage to the elevators inside. Susan had a bad feeling. “I was thinking, the heart is a muscle, you can’t repair it,” she says. “It wouldn’t squeeze anymore after the clots came out.” She suspected Casey would need a heart transplant. Menteer, medical director of CHLA’s Heart Transplant Program and director of the Heart Failure Program, received the case in October 2014, with Casey back in the ICU, short of breath and suffering pain in his abdomen—a sure sign of heart failure as blood wasn’t reaching the abdominal organs. But getting Casey a heart transplant was a complicated proposition. Heart transplant recipients take medications to muffle their immune systems so the body doesn’t turn on an intruder—the donor heart. But with suppressed immune systems patients are susceptible to infection, along with a recurrence of cancer. Menteer needed to extend Casey’s remission as far out as his heart could last, to lower the risk of the cancer’s return while improving the likelihood of a successful transplant. Menteer says there is no governing guideline that spells out the length of time a cancer patient must be in remission before a heart transplant can be safely performed. That determination belongs to an internal CHLA board, the Transplant Selection Committee. In summer 2015, with Casey again in the hospital, his lungs found to be filling with fluid, Menteer decided to act. He convened the board, consisting of virtually everyone on the transplant team: doctors, nurses, social workers, surgeons, dietitians and therapists. “We all sit in a room and we ask: ‘Is this patient ready to be listed for a heart transplant?’” Menteer says. Casey limped along for another year, until Menteer appealed to the board again, feeling Casey wouldn’t survive many more months without a new heart. He was 3 ½ years into remission and now a year removed from his last round of chemotherapy, and this time the oncologists fell in behind Menteer, clearing the way to list Casey for a transplant. It was then up to Menteer to keep Casey’s heart going until a donor match could be found. He considered installing a mechanical heart pump or a ventricular assist device, but that step was avoided. “His medicines did just enough to make him hold on,” he says. In February 2017, a cardiac catheterization showed Casey’s heart function was substantially worse and causing congestion in his lungs. 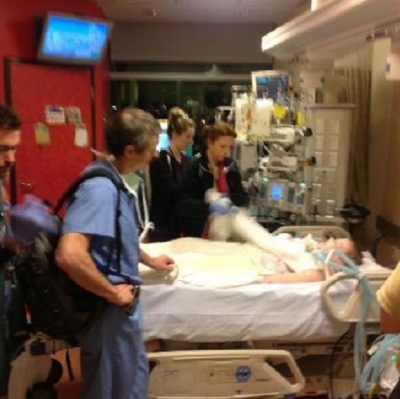 Failing lungs would remove him from transplant consideration altogether. Menteer called Casey’s parents into a waiting area to update them. With Casey’s heart deteriorating, Menteer was able to get his transplant priority raised from 2 to 1A, the highest level of urgency, jumping him up on the recipient list. The early morning of April 11 offered Susan auspicious conditions for prayer. “It was a full moon,” she says. “It was the Pink Moon.” Indeed it was, named for the color of early spring. At just before 4 a.m., as she sat at the window in Casey’s room casting good thoughts toward the glowing orb, her cell phone rang. It was the transplant coordinator. The news of a viable donor heart prompted a series of tasks that had to be carried out in a kind of practiced, precise hurry, advancing quickly and busily to the transplant surgery, which would be later that same day. At about 2:30 p.m. on April 11, 2017, the Fishers, waiting in the hospital café, heard a helicopter arriving. They knew that amidst the cargo was Casey’s new heart. He had some minor signs of rejection after the surgery, fast heart rhythms that still surface occasionally. Menteer says it’s nothing unusual or serious. He’ll stay on immunosuppressive drugs the rest of his life, so there will always be some question of the leukemia looming. But Gaynon says that having surpassed five years in remission puts Casey nearly beyond the risk of a relapse. “It’s the least of our worries,” Susan says. When that’s the least of your worries, imagine your worries. Casey does have several aftereffects from the two illnesses, including memory loss due to the chemo and foot drop resulting from the clots that closed off blood flow to his lower body. With therapy, he’s relearned to walk. He’s starting to get reacquainted with life as it’s meant to be lived by a 13-year-old. He goes to skate parks with friends and wants to get back to the dirt-bike riding he began at the age of 3. His parents are planning for his return to school next fall. Like Gaynon said, it’s good to get the story right. To help kids just like Casey, consider making a donation to Children's Hospital Los Angeles. Visit CHLA.org/Donate.